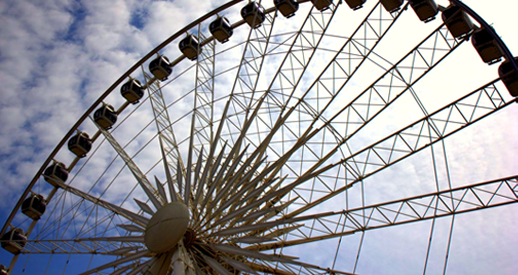 Watch the entire Niagara Falls from 175 feet above the sky on Niagara Skywheel. Whether it is day or night, the climate-controlled Skywheel gondolas give year long opportunities to experience the matchless Niagara Skywheel! This Ferris wheel offers spectacular views of the Niagara Falls is an attraction you should never miss in your visit to Niagara Falls. The Niagara Falls Skywheel is located in Clifton Hill. With 10 to 12 minutes of Skywheel rides, you will get amazing views of the Horseshoe and American sides of Niagara Falls, Niagara River and Niagara Escarpment. The Niagara SkyWheel ride features provides fully enclosed gondolas with heating and air conditioning facilities, so that we can ride day or night, in any season. 4950 Clifton Hill, Niagara Falls, ON L2G 3N4.